Bush would place the nation's security on a more stable foundation if he worked harder to find a consensus agenda with those critics whose assessment of the threat in Iraq and at home was closer to his own. I don't share Brownstein's apparent hope that offering mild suggestions to GWB will moderate his behavior because he wants to improve his place in history. But having dropped out of academia so as to interact with history as an activist for justice instead of as professionally cautious scholar, I'm willing to offer some broad, sweeping comparisons. Polk governed from the perspective and in the interest of one sector of the national economy to the detriment of another. He was president for the slave-holding South. 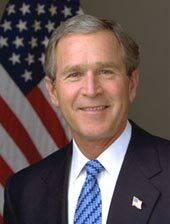 Bush is governing in the interest the section of the economy that thrives on resource extraction, most obviously of oil, but also including mining, lumbering and agriculture. Bush's economy runs on unskilled, low wage, non-union labor. The current blue states have lost their manufacturing base and with varying success made a transition to a relatively well-paid, knowledge-based economy. They are out of the extraction business. The economy Polk represented was on its last legs, although that was not necessarily clear to contemporaries. Many probably thought that cotton would be king forever. In fact, northern industry was about to eclipse agriculture as the engine of wealth. Resource extraction doesn't look so promising in the current global economy; even if we have not found most potential oil fields, extraction economies and their attendant exploited populations seem an unsatisfactory model for the future. Will the U.S. really go the way of Peru or the United Arab Emirates? On the other hand, it is not at all clear that the U.S. can win a leading role in an international competition in science-based innovation. Southerners hoped Polk's imperial war would enable their slave system to expand into new territory. Bush's Iraq adventure seems more like aggressive defensive flailing, aiming prop up an aging system of world dominance that is threatened from numerous directions: insurgent fundamentalisms, new powers, new nationalisms, new technologies. Most importantly, Polk won his Mexican war, scared the British into ceding Oregon and Washington State to the U.S., and generally succeeded with his imperial plans. Regardless of how it is spun, there appears to be zero chance that Bush will succeed in his Iraq adventure. The contradictions that Polk's presidency revealed between geographical regions with profoundly different cultures and economic interests led to civil war twelve years later. The U.S. was a rising power, energetically colonizing a continent and on the verge of creating vast wealth. 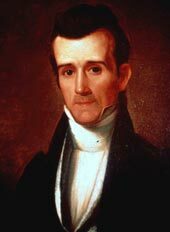 Polk governed in the interests of the losers in the civil war, but nonetheless laid a territorial foundation for future prosperity. The U.S. today is learning that military and economic power has limits. Bush's presidency is likely to be remembered as a destructive detour by a society forced to adjust to the reality of being one nation among many that share a fragile planet. It's an interesting look at two presidents. In many ways I think there are some parallels, however the things George is attempting deviate greatly from Polk's efforts. George is not only failing to build a consensus he's quite literally working over time hammering wedges in place. Not only has a he got us cornered in an unpopular and likely illegal war, that can't really be won. (It's basically the argument of is it a war or a liberation...) If we aren't there as an enemy to subdue the country, but rather to liberate... well we already covered that the Bush administration couldn't build a consensus in the US, how would they hope to do that in a place like Iraq? But to top it all off George is actively battling the Constitution and violating the rights of US citizens. This is not something that can be explained away as "keeping us safe." If you buy that then more study of World History is required. I agree fully though that this does in fact "seed long-term problems that aren't immediately apparent" -- that after all is the nature of why our Liberty cannot be compromised in the name of safety. Tomorrow it will be abused far more and more again the next day. It is human nature and not likely to change. You also stated, "The contradictions that Polk's presidency revealed between geographical regions with profoundly different cultures and economic interests led to civil war twelve years later." I'd agree with that as well and think that the parallels between this Presidency and Polk must be watched. Polk may have started a pattern that lead to the violation of States Rights which in turn lead to Civil War. Let us hope that our current King George does not have a similar effect between now and 2016.